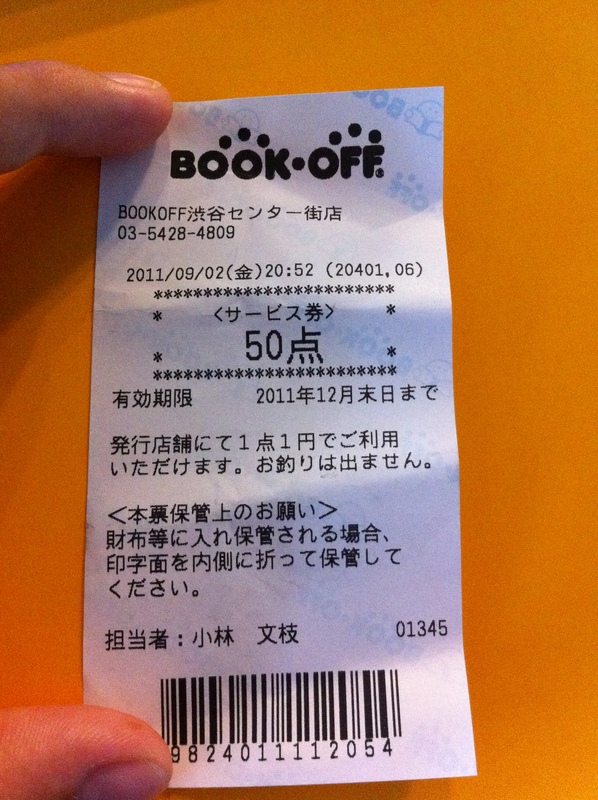 In Japan the name „Book Off“ is quite popular – not only because the shop is known by nearly everybody but it is also loved by nearly everybody. The idea of „Book Off“ is the simple idea of a secondhand bookstore or fitting the wide range of articles better a secondhand store of media items such as DVDs, CDs, Books, Mangas, Comics and Games. The amount of used CDs and Mangas is much higher than the amount of the other goods as Mangas for example are read by many people and CDs can be copied quite easy. As the actual trend shows an decrease of sold Music CDs the CDs are getting less and the DVDs are increasing. Mangas in Japan are cheaper than the Mangas we have in European countries: 400 Yen which is about 3,80 €. In Germany the prices are starting at 5,- € but often the Mangas are more expensive than that depending on actuality and quality of the cover or coloured pages. As in Japan the Mangas are not that expensive they are bought quite easily and doing that some weeks with some series there will be some mangas standing on the book shelf. But they are taking away some precious space which is rare in Japan so once you read your Mangas you can give them away – to Book Off. And get some money. The idea is to make media goods avalaible to everybody and to help people to get rid of their stuff while getting a small amount of the once paid prize. How the different parts of the sales are, what percentage Book Off keeps and what the former owner gets is something I couldn’t find out. But as Book Off is expanding quite a lot since the 90’s I suppose they not doing that bad. 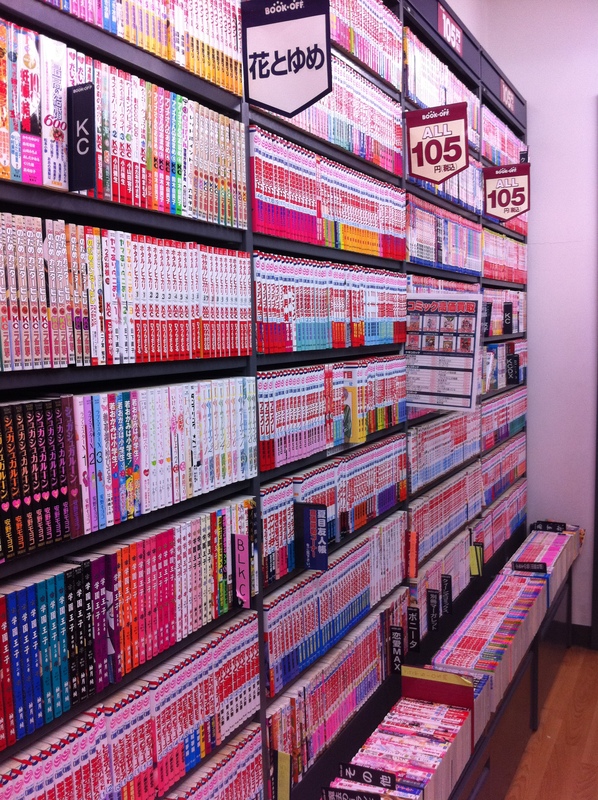 The cheapest pr ize you can pay for a book or manga is 105 Yen and there a uncountable book shelves with those 105-mangas in the Book Off stores. After that it is rising in some steps: 205, 250 and 350 Yen for Mangas – books are sometimes more expensive as they are sold new for about 1,600 Yen. 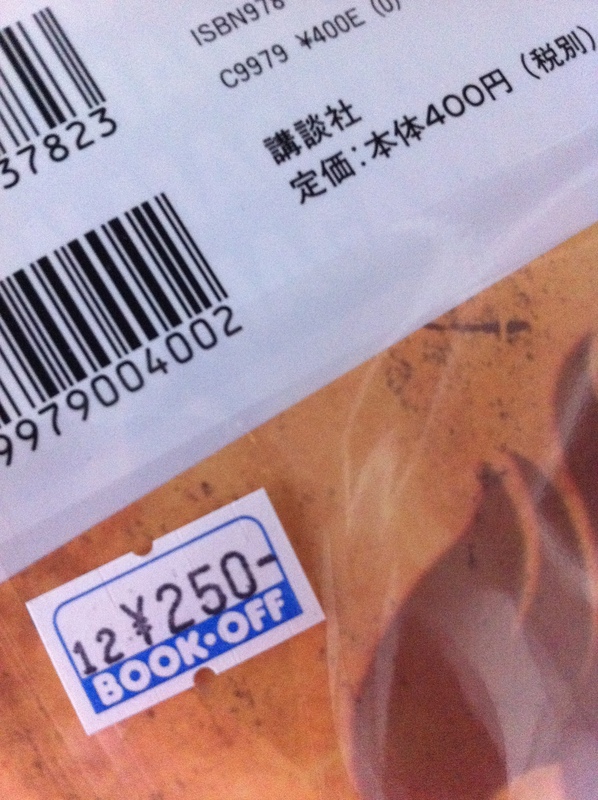 The Book Off prize is depending on the conditions of the Media goods such as cover, tattered pages or spots on pages. But also the acutality is playing a nevertheless important role as actual and popular Books and Mangas are more expensive and are offered with a plastic protective cover similiar to brand-new books. And the older something is the more accessable it is so the prize is decreasing: Mangas and Books of 2005 are much cheaper as those of 2010 and it is possible that there are 15 units of Haruki Murakamis „Kafka on the shore“ so they are a bit cheaper as the demand for new issues is smaller than it was before. Until last year Book Off had a special „Book Off Membercard“ which was very simple: just fill out a small paper and here you go with your card. With that card you could save money: showing it a every purchase you make at a Book Off store you get receipt on which is a small amount written and that one you can turn it at your next shopping time at Book Off. This year they changed it and every customer gets that receipt and so can save money – if you don’t loose that paper.